Conservationists claim that only three sightings of Chinese white dolphins have been recorded in Hong Kong this year. The population of Hong Kong’s Chinese White Dolphins has dropped by 60% since 1997 in what the Hong Kong Dolphin Conservation Society (HKDCS) calles an ecological disaster. Since 1997 the dolphin’s habitat saw the completion of the Chek Lap Kok International Airport, wave after wave of town development in Tung Chung and Tuen Mun, a landfill development and more recently, the construction of the Hong Kong-Zhuhai-Macau Bridge project which is still ongoing. 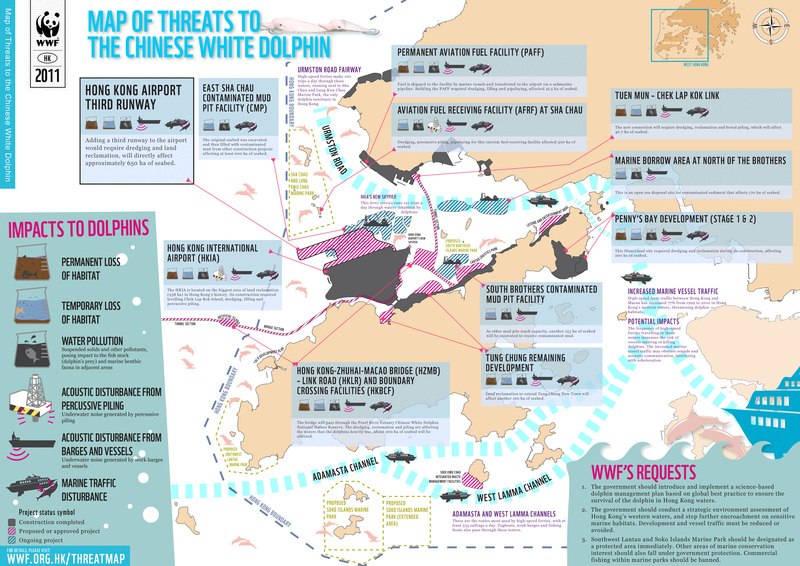 This HKDCS says has almost destroyed the white dolphins habitat. According to statistics, there were 158 white dolphins in Hong Kong in 2003 but this number fell to 62 last year (2013) – a drop of 60% -causing great concern. In addition the current scheme to build a third runway at the airport, would cover an area of 650 hectares and would be the second largest reclamation project ever and is loacted in the white dolphins habitat. But the Airport Authority so far refuses to set meet with environmental groups and refuses to give full explanation of data and has been jointly criticized by nine environmental groups. It is currently understood that the Airport Authority will soon publish and interim Environmental Impact Assessment report on the third runway project and a 30th public consultation will be held. The construction works have forced the dolphins to move further west as the noise affects their navigation and communication skills and the barges parked in the harbor creates sediment blooms affecting their food supply. Either that or they’ve died and or giving less birth. Samuel Hung, President of Hong Kong Dolphin Conservation Society, urged the public to make good use of 30th consultation to express their views and take concrete actions to protect white dolphins. The Hong Kong dolphin conservation, Hong Kong Friends of the Earth and public Professional Union has conducted a “social cost and the returns assessment” study to estimate the effects of the third runway project’s on the public and its social effects which found that the white dolphin could earn Hong Kong some HKD 36.1 billion over ten years in ecological tourism revenue.